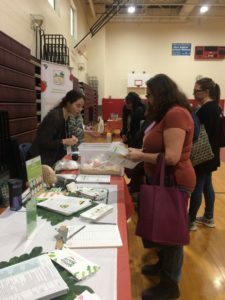 Under SGA’s local food project, the Illinois Farm to School Network (IFSN), staff participated in the annual symposium produced by Collaboration for Early Childhood on Feb. 23. 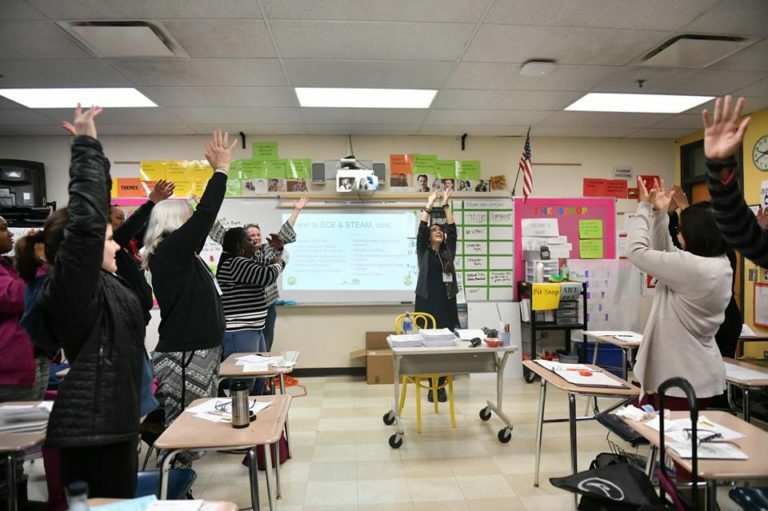 On this rainy Saturday, hundreds of early care providers filled Percy Julian Middle School in Oak Park, lighting the halls and classrooms with conversation and eagerness to learn. 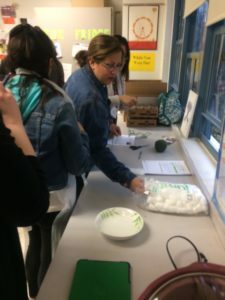 SGA’s IFSN staff led two workshops on incorporating local food and nutrition into ECE programs, filling every desk in the seventh grade classroom. 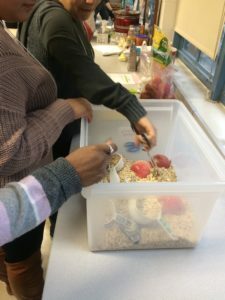 In the morning session, attendees learned about how farm to school can work in an early childcare program and tested three example play stations: beet stamps, seed necklaces, and a sensory box with apples, oats and cooking tools. Much like reports from IFSN program participants, the activities were all a huge hit! The educators left with directions for each play station as well as with resources on connecting nutrition education to ECE curriculum. The play stations were available for all symposium attendees to test out during the midday open block where all the presenting organizations showcased activities in the gymnasium. During the second workshop, the presentation included tips and tools for establishing relationships with farmers for best procurement. Attendees got their hands dirty creating an easy Harvest of the Month recipe that features local apples and pumpkin and can be made with young kids and in CACFP programs: pumpkin apple butter. They also left with a sample of an ECE and CACFP healthy snack recipe that features local carrots and grains: carrot joy in a jar. To finish the day, IFSN staff taught the educators “The Dirt Song” as an activity to engage young eaters in concepts about where their food comes from. SGA and IFSN thank Collaboration for Early Childhood for hosting and inviting us to present at their symposium, and to all the attendees for engaging with us. Farm to school means kids win, communities win, and farmers win! Join the movement now. Northern Illinois Farm to School Boot Camp, May 17, 8:30 a.m.